We began the week (Sat., Sun., & Mon.) with a massive storm front, lots of rain, and big winds. Fishing during the storm was challenging and afterward was tough for a day or so. 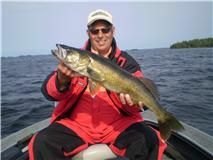 We rebounded nicely for the last half of the week, but the big change is that the walleyes have moved deep. Most of our fish this week were caught between 25 – 35 ft.
We found the bite to be “pulsey” this week. A spot would be quiet early in the day, would have action for little ones later, and then have a 1 – 2 hour period when the big ones would bite. We made a habit of spot checking known big fish areas several times a day to capitalize on the daily changes in activity. Overall production for big fish remained consistent throughout the year. Despite having a cancellation and a photo crew in camp this week we still had good numbers for big fish with 24 walleyes over 27 in., including 2 – 28s. 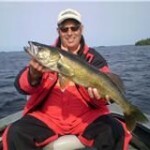 Guide sheets averaged 30 walleyes over 18 in. per boat. The highest daily total was 54. Jigs and minnows were top producers, but I saw more 3/8 oz. jigs this week along with 1/4s for the deeper water. 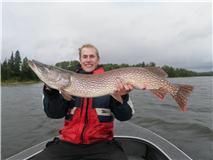 We continued to have a few guides mix up the day by hunting for big pike. 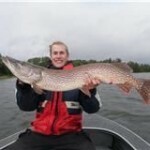 The biggest surprise for me this year is how consistently successful we have been catching really big pike. This week was no exception, we had 1 – 40, 2 – 41s, and 1 – 43. I can’t believe that my fishing season is over. I begin packing today and head back to Iowa to get ready for another whitetail deer guiding season. It was a great season in terms of both weather and fishing. We will have a new brochure and new website coming out this Fall. Demand for spots is on the rise. We will be staying open for an extra week in Sept. for 2011 and the waiting list for cancellations has about a half dozen names already. If you are thinking about fishing with us in the future, plan to contact us this Fall, as I expect the book to be full by mid Jan. for 2011.